analysing variances in the schedule and budget as the project proceeds. As the project work is completed, its value is considered "earned" from the point of view of tracking progress. The authors contend that EVM has its limitations, namely, that it does not include guidance essential for a successful systems engineering project, namely: the integration of requirements, risk management and quality aspects. Hence, the authors propose some key enhancements to EVM that they call performance-based earned value (PBEV). 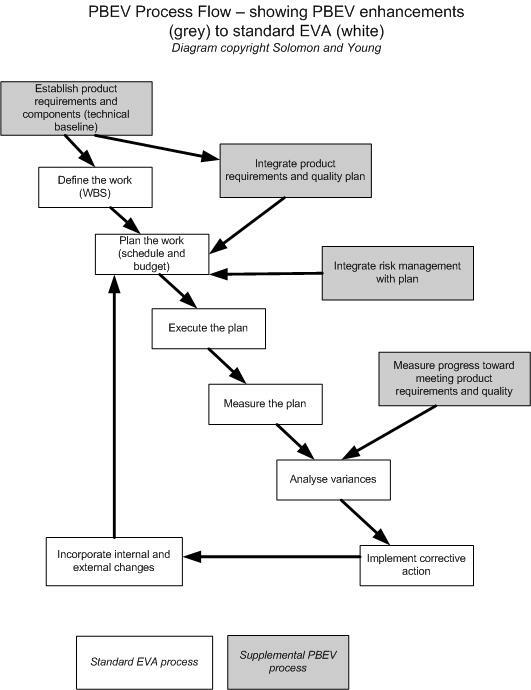 the integration of risk management to the baseline plan. to minimise the number of work packages being tracked. The agile approach is further discussed in the chapter describing software-intensive projects – ie those biased toward software engineering rather than systems engineering. As is to be expected, there is little mention of use-case- or scenario-based methods, although usefully the adaptation of PBEV to iterative approaches is discussed in context of a worked example. Another highly-useful section is devoted to trade studies, ie activities that examine the marketplace for potential solutions to system requirements. Although the example in the book details a study for components of a system, it could be easily adapted for use for the selection of commercial-off-the-shelf (COTS) software products. This thought-provoking book will attract many readers. Experienced EVM practitioners will want to read this book to see if the authors’ enhancements are suitable for their work. Although the book is written for experienced users of EVM, there is a useful appendix on EVM basics for those less familiar with the technique. In addition, the book is a valuable aide-memoire of the requirements process in complex, large-scale systems engineering projects. It summarises how requirements are analysed and integrated in the project plan. Requirements engineers will want to read it to understand what metrics are required by their project board, and why. Agile practitioners who are already using lightweight versions of EVM to incorporate into their work will find the book’s emphasis on completed requirements as the basis for earned value - is in tune with their ways of working. However, those agile practitioners who are just looking for a way to use a simplified version of EVM on their agile software project may care to look elsewhere first, then return to this book for further ideas.